We took in the clear sky from the back porch. The nearly full Moon. Orion rising. The bright winter stars. But all very briefly, in the sharp dark winter chill. Brrr. 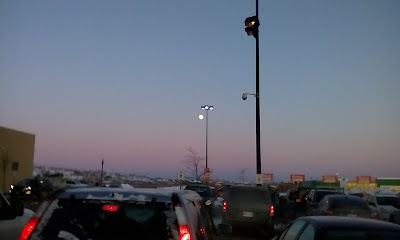 Noted the big Moon as I walked to the store. 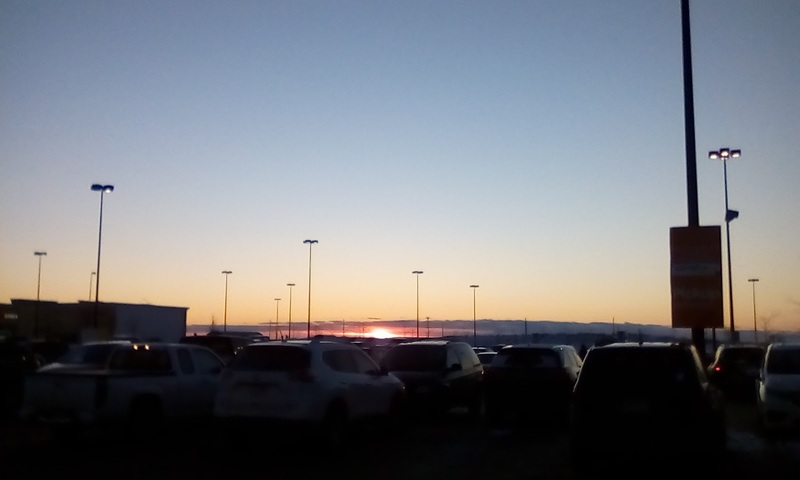 After a quick grocery shop, I noted the colourful sunset. Looking east. The Earth turning toward the Moon. Shot with alcatel smartphone running OpenCamera. 2017, in terms of blogging, passed the number of posts for 2015. But then that year showed a significant drop. Something of a blip. The previous threshold passed was 2010. This means that '17 slides in at 6th spot. Solid. Stepped down from my councillor role for the RASC Toronto Centre. Having retired from the CAO director role in '16, this relieved me of significant volunteer assignments. I have been struggling with burn-out. I still write for the RASC Journal which I enjoy although struggle some times with ideation. At long last, the result of a multi-year journey, I made my first three-dimensional part which is not by itself astronomy-related. I made a part for telescope and it was somehow rather satisfying. I enjoyed capturing imagery with a tiny video camera on-board one of our model rockets launched during the open house at the Carr Astronomical Observatory. The little device worked remarkably well. Rhonda and I made a solargraph, thanks to Risa, Ian W, and crew. We installed the extra pinhole camera late 2016 and let it expose for the spring and summer. We were very happy with the result and wanted to do it again. We made and installed two new cameras (with slight modifications). 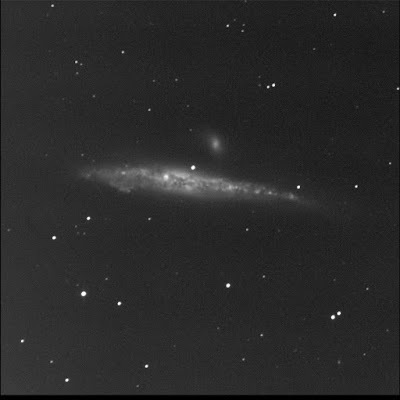 I continued imaging with the Burke-Gaffney Observatory in Halifax. I captured more of the Finest NGC objects. Combined with visual observing, I have seen almost all deep sky objects in the RASC list. Some fantastic sights. 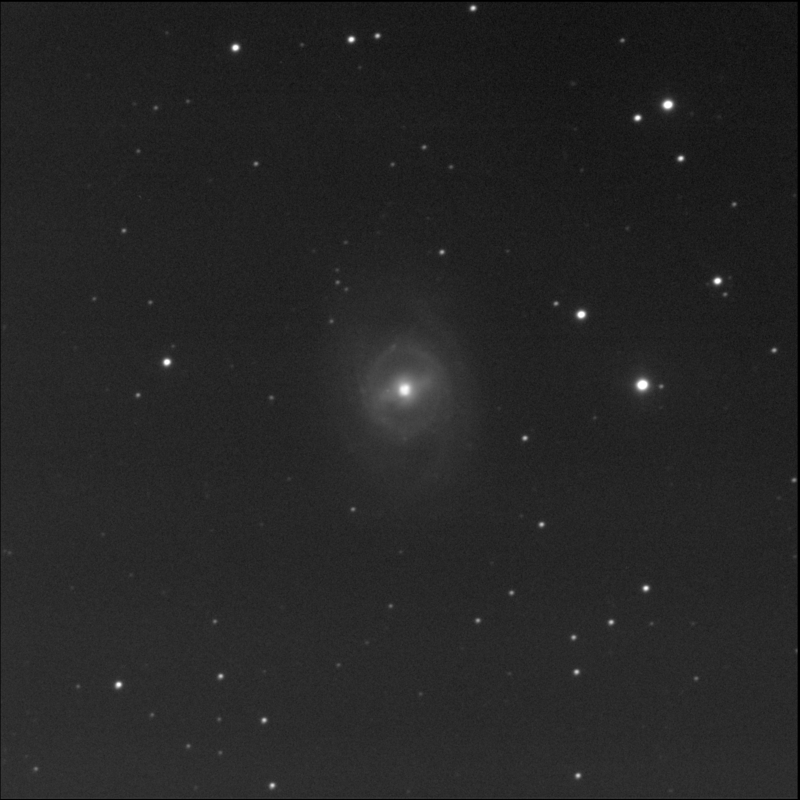 While going "around again" I gathered additional data to improve quality and use other filters like O-III for planetary nebulae. 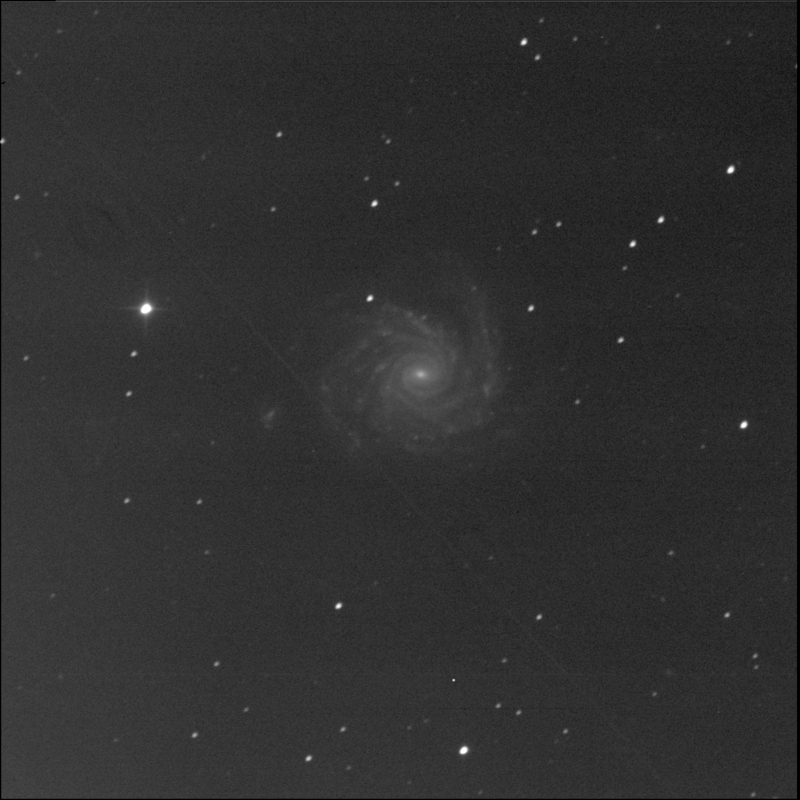 After learning in late-2017 that I could override the minimum altitude setting allowing the telescope to go lower, I realised that some targets previously considered inaccessible may be possible to photograph now. I still struggle with image processing. I had wanted to amp-up my double stars work and was somewhat successful. A major milestone was reaching a total of 1100 viewed doubles. Total attempts are near 1200. Happily, I saw a few more tight pairs, below 1 arc-second. I was thrilled to have a double star photo published in Sky and Telescope. I also imaged many doubles with BGO. 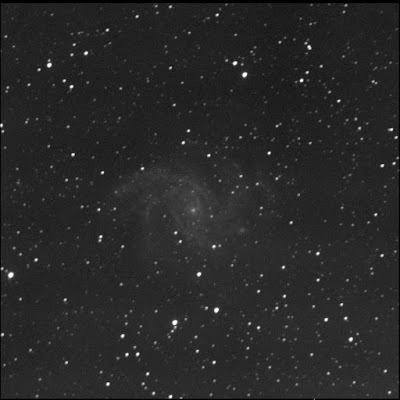 It was fun monitoring the supernova in NGC 6946. It blew in the summer, remains visible, but is slowly fading. I continue to revisit some of the Messier objects. I visually took in some while photographing others. This is part of the plan to ensure I have seen all the Messiers at least twice. 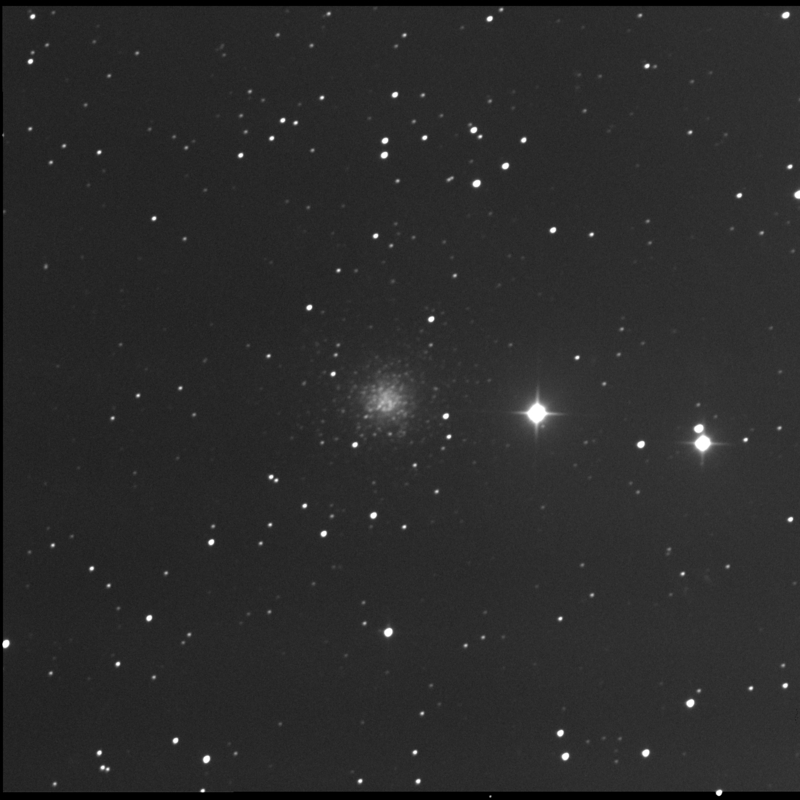 Imaged a couple more Palomar globulars. A little side-project. Rhonda and I saw lots of Orionids while up north. That was fun. Really wanted to see the Geminids but it just didn't work out. Did little observing in backyard sadly. That said, we enjoyed an amazing view of Jupiter in June. It was fun trying out some different gear this year. Using an 11-inch StarMaster was a treat, for example. This year I observed and imaged from a few new locations: Big Hawk Lake, the Wanakita camp on Lake Koshlong, Upper Stony Lake near Crowes Landing, the Merritt Reservoir in Nebraska, and Glendo in Wyoming. A couple of those were obviously were as a result of the eclipse trip. It goes without saying that seeing my first total solar eclipse during the fun road trip, while visiting more of America, was the highlight. I was happy with my solar eclipse photography even though wide angle. My only regret was not being able to share the spectacle with Rhonda. Being and observing with Rhonda has been good for my astronomy. She puts many questions to me and researching and answering them helps me better understand the science and physics behind them. An announcement was added to the Skyhound web site regarding SkyTools version 4. Woo hoo! It's happening! Rhonda and I exchanged gifts after returning from St Thomas. Received two astronomy-themed patches. A solar eclipse one; one on NASA exploration. Very neat. I gave her the 2018 RASC calendar. She was happy. Lovely photography, of course. I noted a few by Alan Dyer. Enjoyed reading the article at Sky and Telescope on the top stories for 2017. Item 1 was the latest LIGO detection. I still feel like gravitational waves is a really big deal. I believe the detections of additional black hole mergers, and now neutron star events, is going to crack open fantastic new things. This is undiscovered country. The Oumuamua discovery was very cool indeed. Truly, out of the blue. The discovery of an eight-planet exosolar system certainly occurred in 2017. And while very interesting to me, I don't think it is all exoplanets have yet to offer. I have a feeling there are going to be many more revelations, some astonishing. The total solar eclipse, not surprisingly, made the list. What struck me, as I read the piece, was the personal connection. One of the ten things I actually, directly, experienced. Retrieved a bunch of astronomy books from storage. I was surprised by some old goldies. I was very happy to run into Turn Left at Orion. 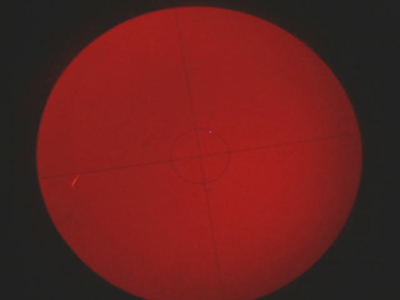 But I was irked that I couldn't spot Observing and Measuring Visual Double Stars. From the the family, I received some fun astronomy and science fiction related gifts. 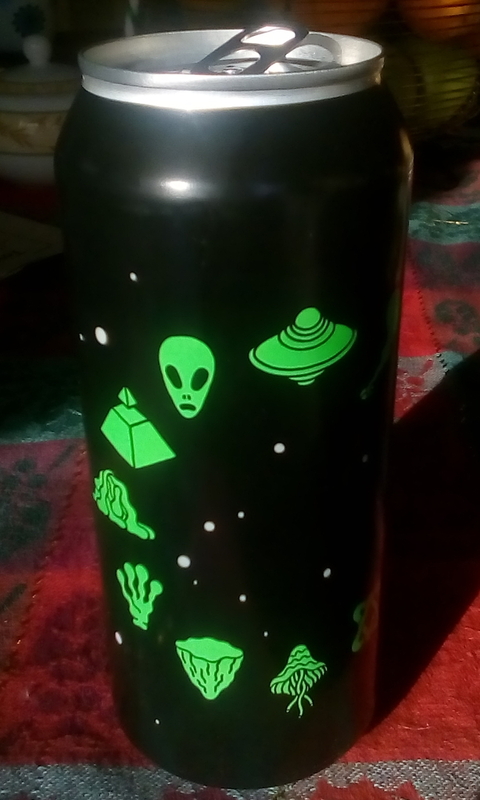 Space Invader candy in a little tin. Canadian Geographic magazine from 2013. An article on solar activity and the effects on the Earth, such as aurora. Donna phoned us and ordered me to change the channel. Steve had been monitoring CPAC. There was a documentary on entitled Ambassadors of the Sky. They talked about people's love of the sky, light pollution, dark sky preserves. I recognised a couple of names. And then James Edgar, past-president. Cool. Learned that the feature was made by Brandy Y Productions for a CBC documentary series. And there's a promo video online. "Ambassadors of the Sky" promo - a new documentary by Brandy Yanchyk from Brandy Yanchyk on Vimeo. Wishing everyone a happy solstice. Rhonda and I took to the snowy back deck to install our third pinhole camera. This one is in deference to our anniversary for the first beer can camera we set up about a year ago. This installation, like the one at Wanakita, has the aluminium can upside-down. We hope the continuous metal bottom will reduce the intrusion of water without resorting to a cap or cover. The result, scanned in July 2018. The Burke-Gaffney Observatory was up and running again. The robot imaged NGC 1232 for me. 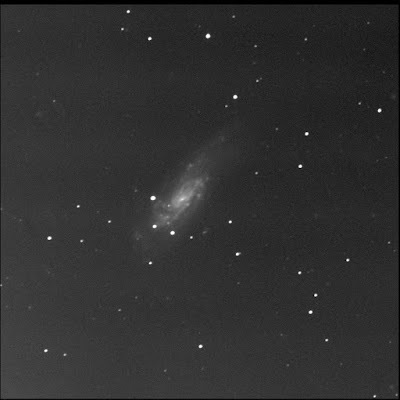 A faint face-on galaxy low in Eridanus. One of the RASC Finest NGCs. Is this what our home galaxy looks like? The spiral arms seem somewhat disturbed or bent, due to the companion galaxy, no doubt. Hence the Arp 41 designation. The large arm opposite 1232A has a definite kink. 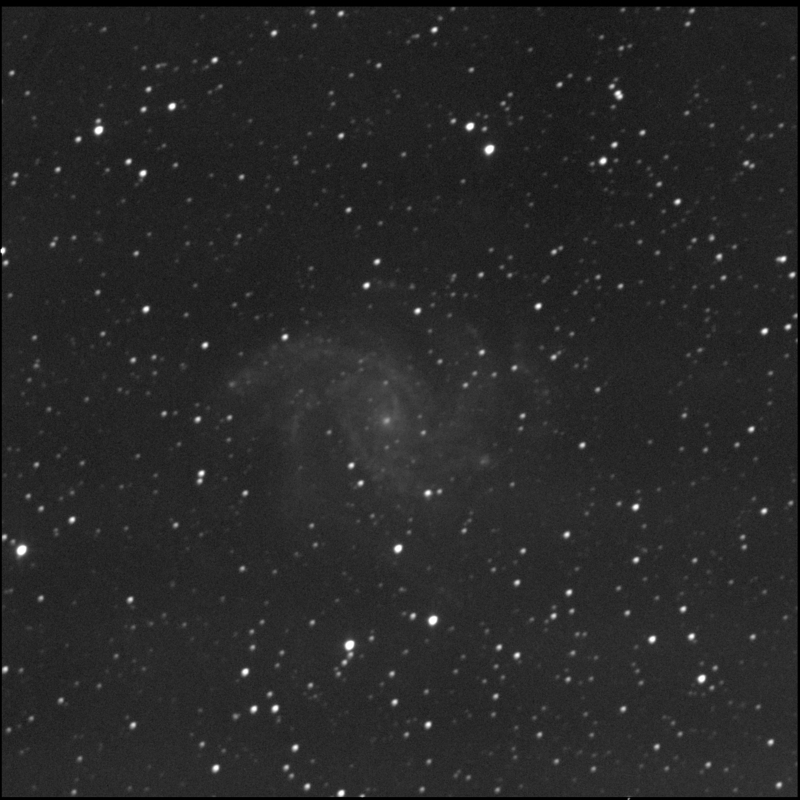 Meanwhile the east arms are being pulled toward the small attractor. South-west of the grand spiral is a small faint fuzzy: LEDA 838076. It is near the star J030917.8-204247. 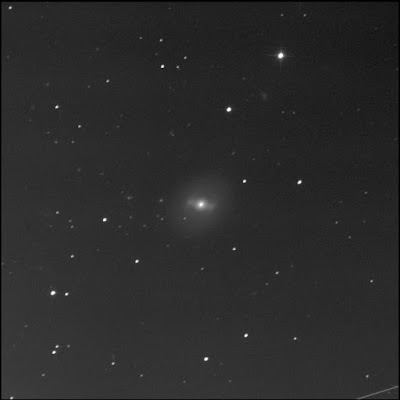 The round circle to the south-east is a satellite galaxy designated as NGC 1232 A.
I noted a faint small oval fuzzy, LEDA 840370, east of the bright star HD 19764. Sadly, there's a faint satellite trail through the centre of the image. This was one of the first BGO targets programmed using the minimum altitude setting of 20. My first attempt to shoot it, issued in Oct '16, returned the result "never rises high enough." Recently, when I tried again, I received the response that it would not work "in the next 30 days (with given exposure parameters)!" Which made me think it was possible. That's when I learned about the default elevation and that the mount could go lower. SkyTools said the true altitude was 24° 50' while the altitude above visible horizon was 25° 13'. Gar! There's a faint tumbler. 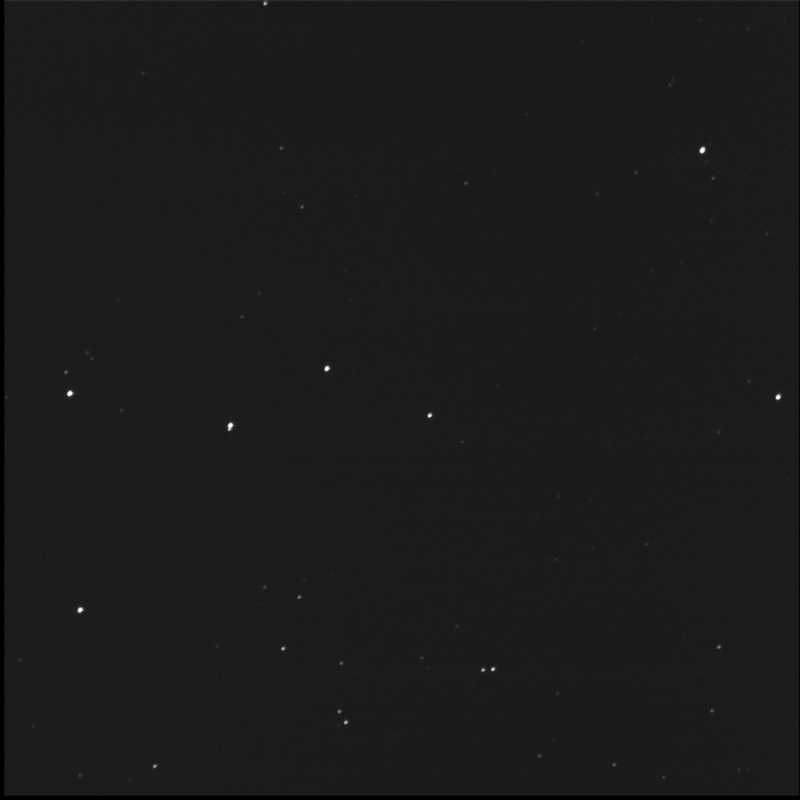 Imaged again on 2 Jan '18. 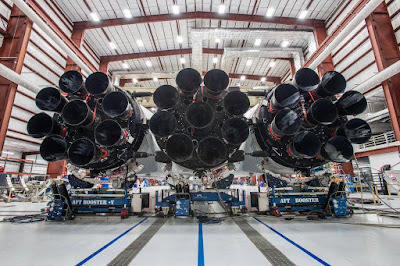 The Heavy launch is tentatively scheduled for January. Did more SkyTools 3 testing for Skyhound. 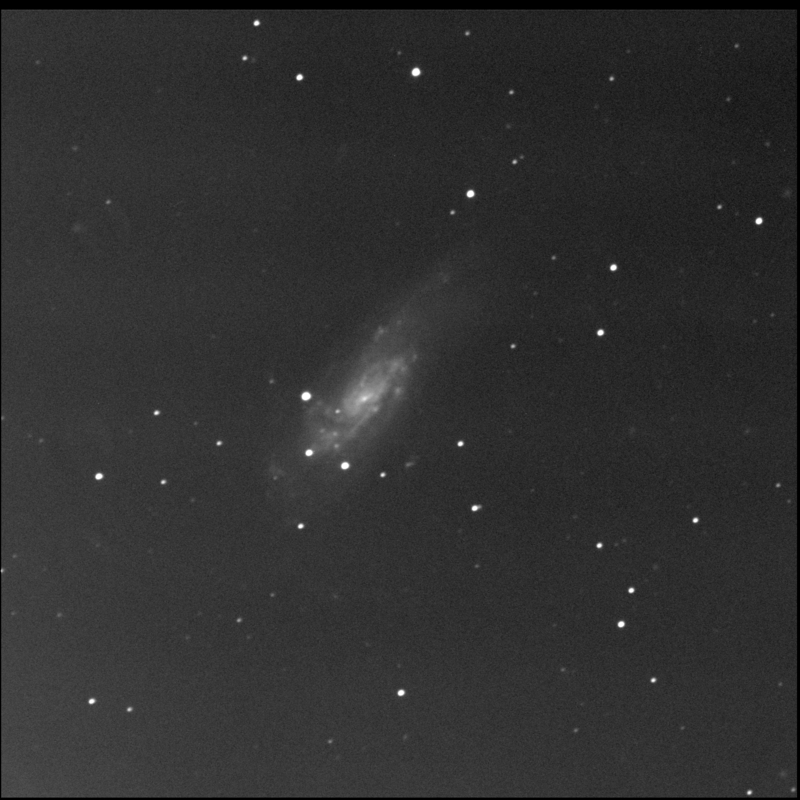 The first time BGO imaged NGC 4414, it returned frames that seemed out of focus. The first attempt was on 14 Apr '16. Tonight's run produced slightly better results. 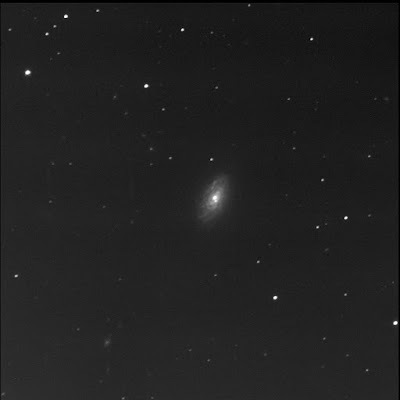 With the capture of NGC 4559, I've now logged 106 of the RASC Finest NGC targets. Only 4 more to go. 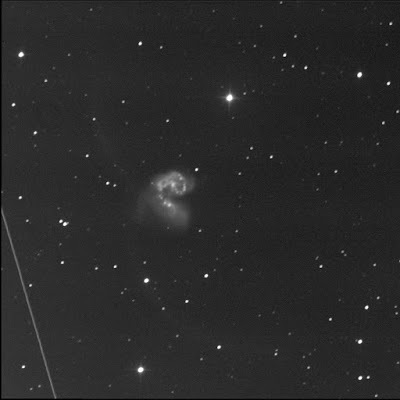 The Burke-Gaffney Observatory robot tried to image The Cocoon, another RASC Finest object, for me but it was very late in the evening. 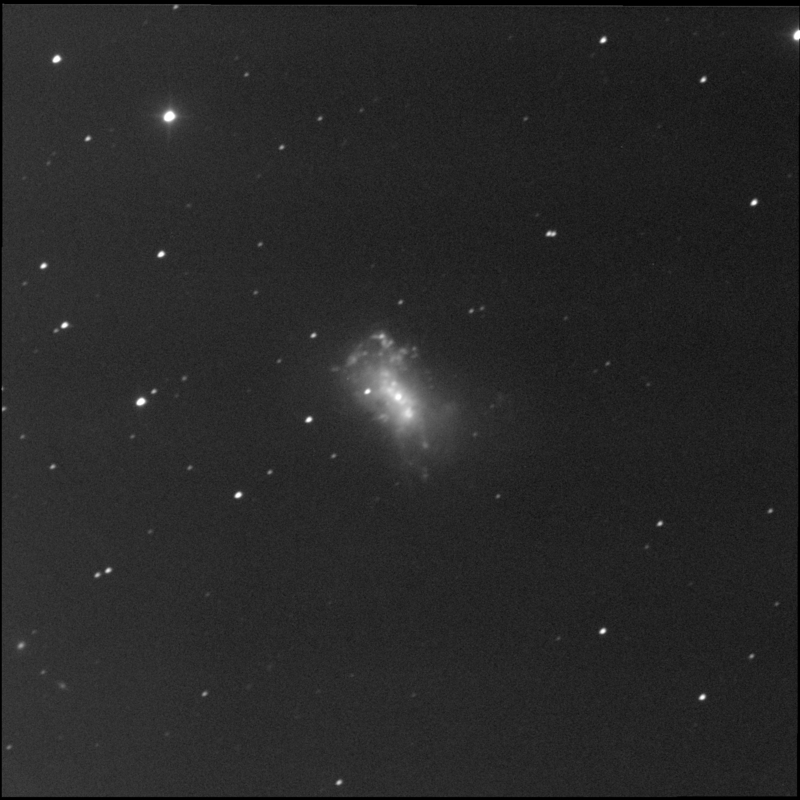 I received the luminance, red, and green data for NGC 4490 but then something happened. I suspect the sky between Herschel 400 galaxy in Canes Venatici brightened with the coming dawn. The small but interesting group also known as Arp 269. NGC 4485 is clearly tugging at the big spiral of 4490, warping and bending it. Due east of the grand pair is the small round ball of lint, LEDA 2185016. 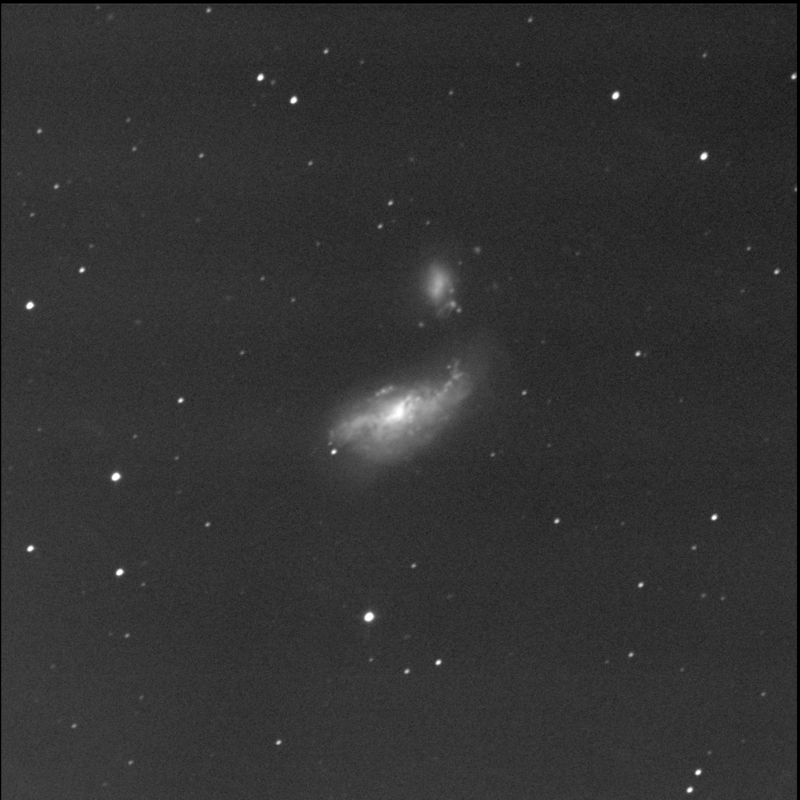 LEDA 2185640 (upper) and LEDA 2185391 (lower) appear to be satellite dwarf galaxies in the group, just west of 4485. Both are not round and diffuse. 2185640 is the brighter. Near the top-left corner of the image is the oval fuzzy, LEDA 2187250. LEDA 2186780, north-east of the Cocoon, is between GSC 03020-0480 and GSC 03020-1834. First viewed on viewed and sketched on 5 May '13. Reshot on 11 May '18. BGO collected photons from NGC 4274. 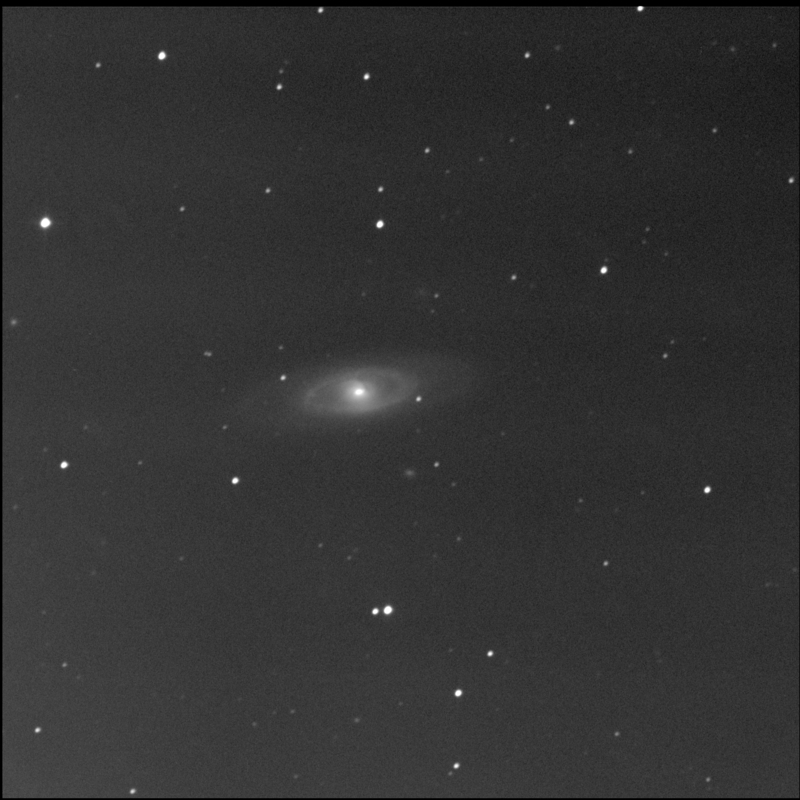 A galaxy in Coma Berenices. One of the RASC Finest NGCs as well as a Herschel 400 target. I had first viewed this interesting galaxy on 4 Jul '16. 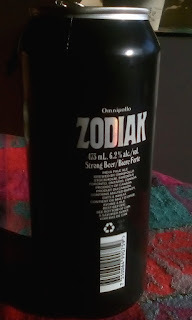 It features a bright condensed core with some nearby dark elements. It is surrounded by bright ring. And then there's a very large diffuse disc beyond. Very interesting. I think there's something north-north-west of the galaxy but nothing is noted in SkyTools 3 Professional. There's a very soft diffuse brightening. SIMBAD and AladinLite show it is LEDA 213976. South-south-west of the big spiral is a small, faint oval, LEDA 213975. 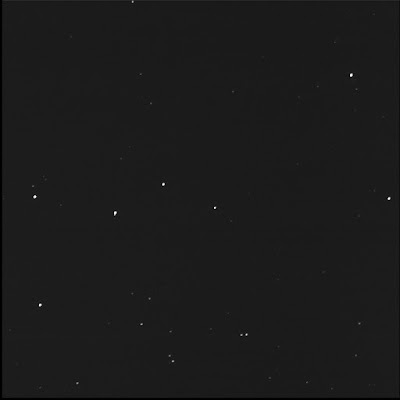 Also, nearly due east of the 4274, near the edge of the image, is a bright but small round fuzzy. Not marked in the software. SIMBAD and AladinLite note this is a "GiC" or a "Galaxy in Cluster of Galaxies," specifically 2MASX J12203217+2938184. 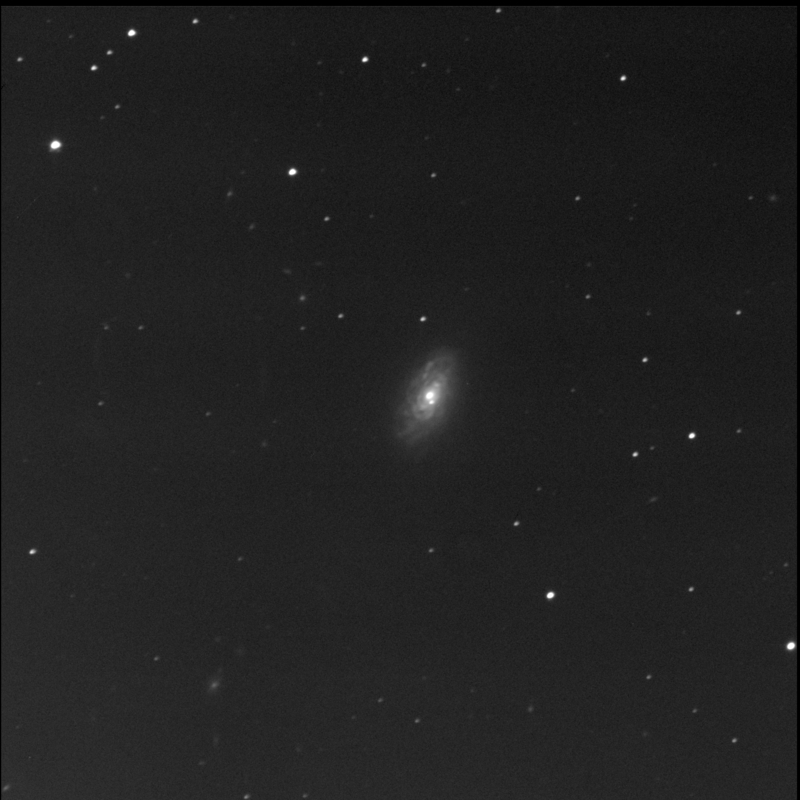 Imaged again on 12 May '18. 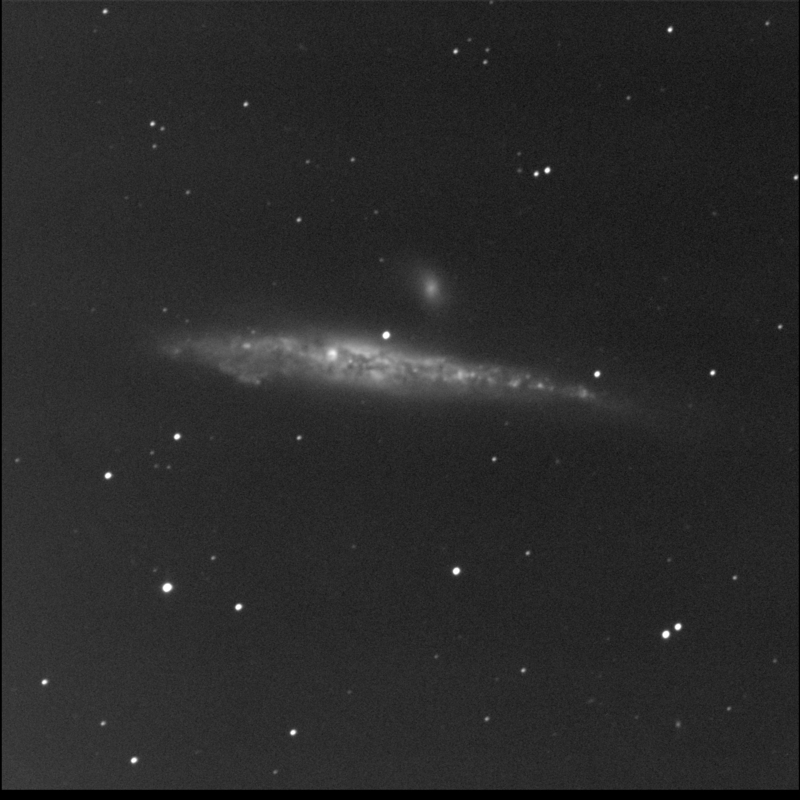 BGO imaged NGC 4559 also known as Caldwell 36. This is a large canted galaxy in the constellation Coma Berenices. It is one of the RASC Finest NGCs. One I had never seen before. It is not uniform or symmetrical. It seems it has been tidally disturbed. The outer spiral arms to the west are extended or stretched. 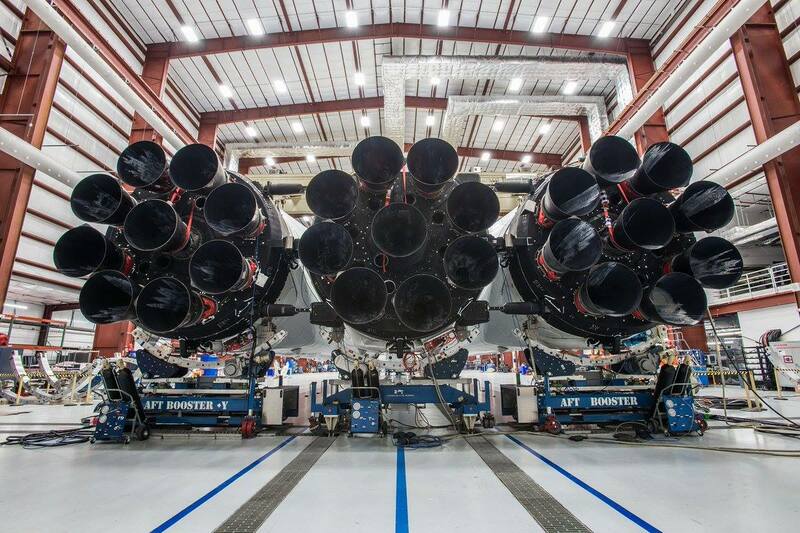 This is curious to me as I do not see any other big galaxies near by. My SkyTools software shows objects within the galaxy. The large diffuse nebula IC 3555 is north of the core. IC 3552 is north-west of 3555. It is much smaller. IC 3551 is north-west of the nucleus and nearly due west of the bright foreground star TYC 01992-1757 1. To the south-east of the core is IC 3563. It is south-east of GSC 01992-2058. Always amazing, seeing nebulae inside distant galaxies. To the north-east of the galaxy is a tiny fuzzy, LEDA 93665. North of 93665 is a small lint ball, LEDA 1825270. There's an annoying gradient in this image. There are some strange bands too, running horizontally. Rhonda and I fired up Netflix and took in a strange episode of Stranger Things season 2. When it finished, we noticed the night was still young. I suggested we check the recently added. She spotted the show on NASA's Voyager mission. We enjoyed the space documentary (even though rho missed some bits) by Emer Reynolds. It was fun spotting people I knew in the 40th anniversary special. "The Farthest" had a wonderful visual style, featured some of the music from the golden record, snippits with Carl Sagan, and teary scientists. Amazingly successfully. And still going! I learned a couple of things too. I didn't know, for example, that the rocket launched with solids. Sadly, they revealed that just when the press conference for the Neptune imagery was due, the Challenger exploded. The pain and the glory. Rhonda asked me how the probes were powered. Little nuclear reactors. She wondered how the imaging system worked, correctly assuming digital sensors were not available in 1977. I looked it up. Television Vidicon cameras with analog elements. Amazing. I showed her where the current probes were, including the two Pioneers and the recent New Horizons, using Heavens-Above. 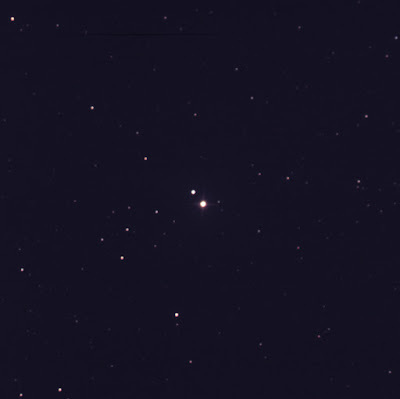 I ordered the BGO robot to aim at Tycho 34170 0943 1 so to capture double star PPM 50856. I don't recall exactly why I wanted to view this pair in Lynx. It was on my "view again" list in SkyTools. Luminance only, 3 seconds subexposures, 20 stacked shots. FITS Liberator, GIMP. North is up; east is left. The pair in question is east (left) of centre. Very tight. Nearly the limit of the BGO system. The B companion is nearly due south of the primary. The consort is about 1 or 2 magnitudes dimmer. First tried to view this object on 25 Mar '11. Rhonda reported it was really clear. Ugh. I was already horizontal, cozy, winding down. Too tired to suit up. I only had about 3 hours sleep the night before... Damn. 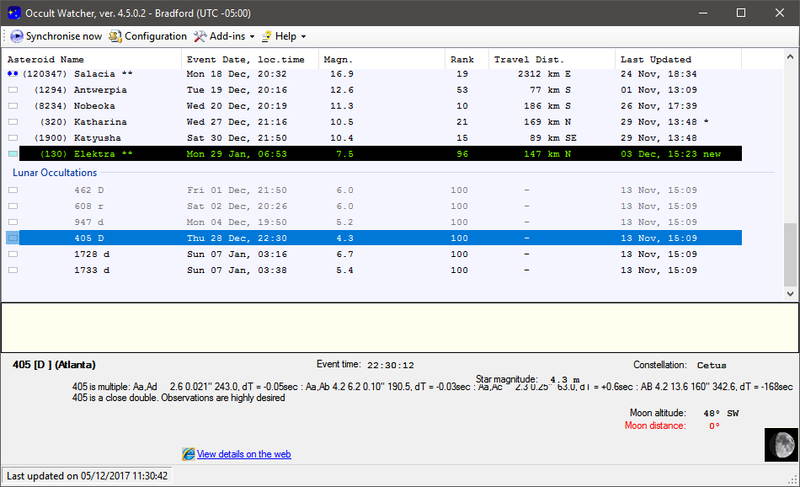 Showed her the Geminid meteor shower live report chart from the International Meteor Organisation. Already low, between 15 and 30 per hour, down from the peak of 150. Spotted a very thin crescent Moon through wispy clouds, low. Wow. Looking higher, I saw a bright point. Jupiter! Yes. I thought I saw something up and right but when I tried again, nothing. Beige, bottom-lit cloud bands now blocked the planet. Was something there? Checked later, with Live Star Chart on the Android and Stellarium on the netbook. Mars was much further away, about the same distance as the Moon. So it could not have been the red planet. And Zubenelgenubi was below. And much dimmer. The core is fascinating with the bright nucleus, the obvious bar, and the bright ring connected to the bar. But there exists a very large diffuse oval halo around the ring. Very interesting. 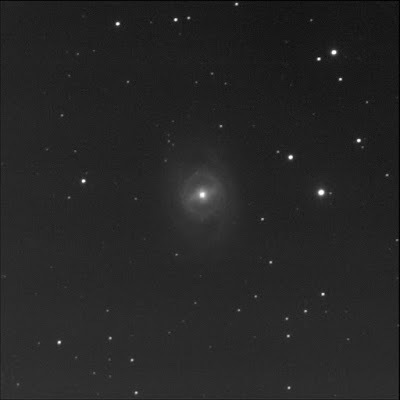 First viewed this galaxy in 19 May '12. My notes are scant. I noted 95 was smoother than 96. Uh huh. It's been a while. Between student projects and bad weather, I've not received any BGO images for some time. I added NGC 4631 aka The Whale to the queue back on 25 Nov. The robot finally imaged the peculiar galaxy in Canes Venatici. 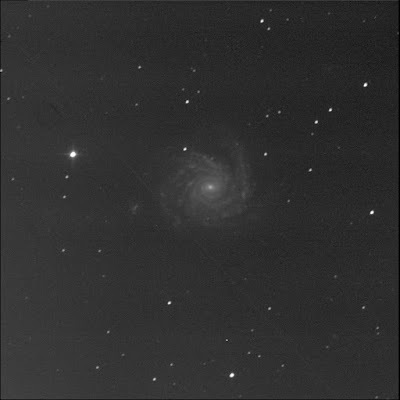 A RASC Finest NGC target. A fantastic sight. 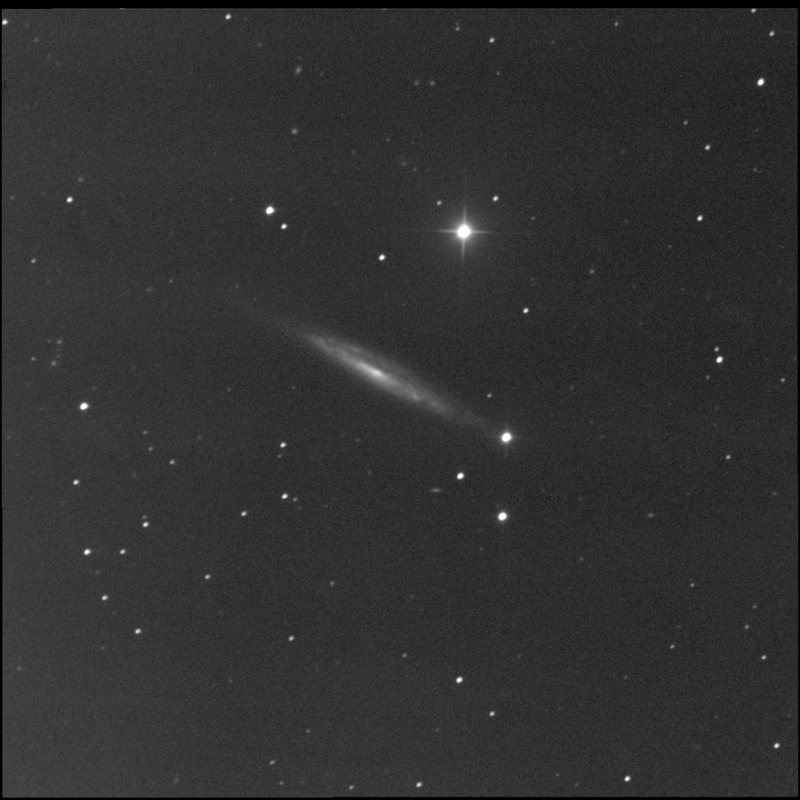 NGC 4627 is the little galaxy above (north). Together they are known as Arp 281. First viewed on 5 May '13. Spotted the Moon, waning crescent, over High Park. But I couldn't see Jupiter. Sky was too bright, me thinks. At the RASC Toronto Centre meeting, the new team supporting the David Dunlap Observatory was announced. Dr Bhairavi Shankar will chair the group which will report to the Education and Public Outreach chair. Arnold Brody, Eric Briggs, Liza Hancock, Chris Vaughan, and myself make up the rest of the committee. Rhonda peeked outside and reported it was cloudy. Boo. No stars. No Geminids. I learned (using the Washington Double Star database) that the bright pale orange star at the top-left corner of the M25 image, i.e. 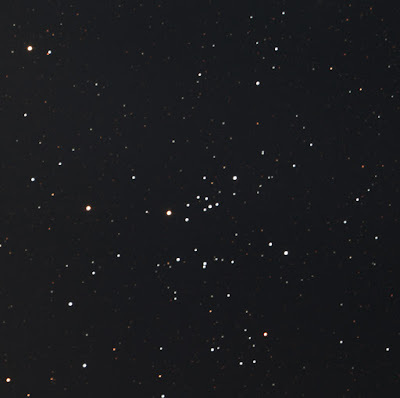 north-east from the centre of the open cluster Messier 25, is double star ARN 52. It consists of a pair (only) with A at magnitude 7 and the secondary around mag 10. They are separated by 69 seconds of arc. The position angle of B is 262°. B is white. 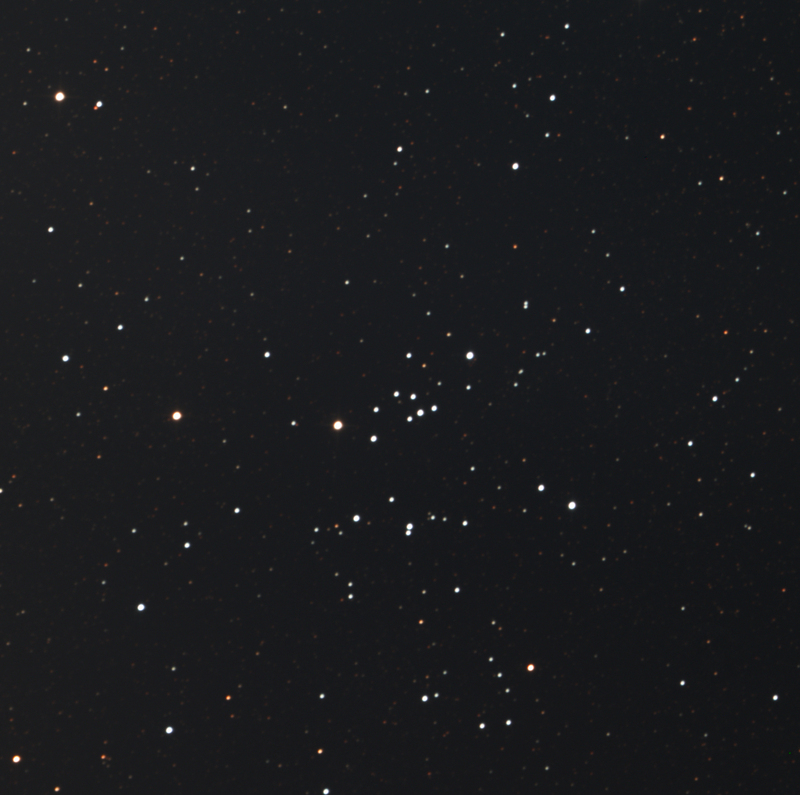 SkyTools 3 Pro shows these stars as HD 170886 and TYC 06275-0740 1 respectively. The magnitudes match. The position information matches too. Then B appears to have a tight deep red companion! Interesting. 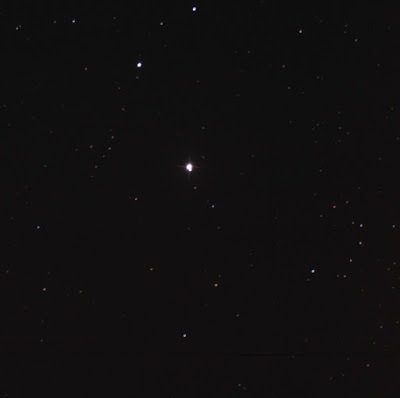 The relatively bright star below BU 966 C is D, according to the WDS. Slightly brighter than Q. Almost due south of C. Close to C. Off-white. The D star is not listed in ST3P. The WDS shows ARN 107 in the area. A simple pair, with magnitudes 9.7 and 10.9. The quoted PA is 289; sep. 21.2. 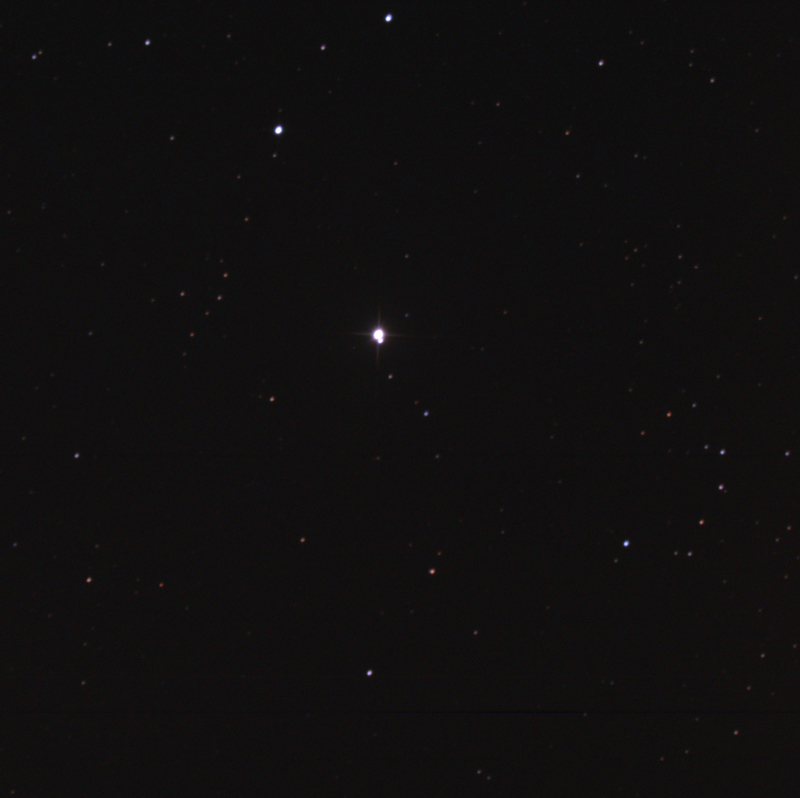 This is nearly due south of BU 966 C (and D), east of the bright orange star TYC 06274-1625 1. The A star is white; B is grey. ST3P does not note this double; the individual stars are TYC 06274-1251 1 and TYC 06274-1349 1. I noticed this in the August image but didn't dig deeper at the time. All white-grey stars. South-east of ARA 753 a very tight pair. The bright element is between the magnitude of 753 A and B. The position angle is around 135°. The stars are touching. So they are probably have a separation around 4". This extremely tight pair is to the north-north-west of a medium-bright star. This star shows in SkyTools as TYC 06274-1650 1 at mag 11. But the pair is not shown in the software! The WDS refers to ARA 752. 752 is a pair, mag 11.0 and 11.6, PA 284, sep. 10.9. The angle is very different. 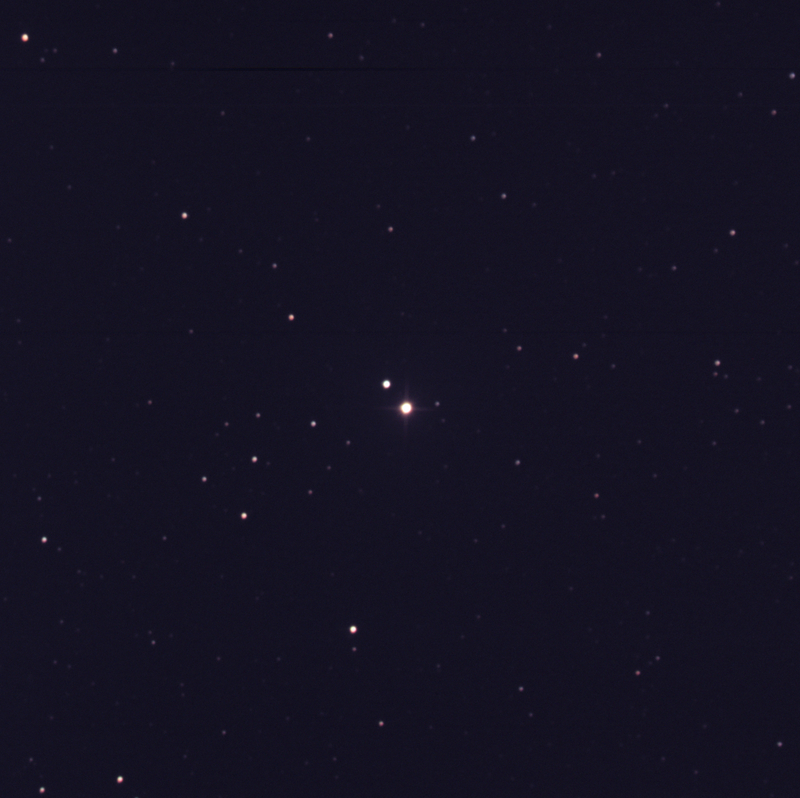 The gap between the tight pair and the Tycho star looks double the ARA 753 sep. So, is this it? It's a little confusing. 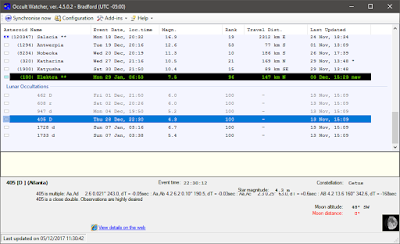 Used Aladin briefly today to check on stars in Messier 25. Noticed, for the first time, a Gaia link. w00t! The first data release is accessible. Using the Magellan telescopes in Chile, scientists have discovered the furthest black hole to date. With light travel time more than 13 billion years, this makes it a young black hole, in one of the first galaxies. The quasar is 800 million times more massive than the Sun. That's big but there are bigger black holes. Check out the article at the CBC web site. Mr Markov liked the subtitle of my first double star presentation. Unnoticed Treasures. Added some new items to the astronomy tips and tricks page over on the lumpy companion site. Specifically on noting the direction in the eyepiece (west), understanding the presentation in the ocular (rotated or mirrored), matching charts or maps to the telescope magnitude limits, and understanding the scale of the sky. I believe these very important for the new astronomer. I went through the December issues (which include the index for the respective year) of the RASC Journal all the way back to 2006 looking for pieces on double stars. And there was nothing. Amazingly, no specific articles on double or multiple star viewing, imaging, measurement, etc. I found one item, in the February 2008 issue, by Ling where he shared his discovery of a double star (ZC1042 aka SAO78770) during a lunar occultation. Cool. But it is somewhat shocking that there are no other items. Not sure why. Also, the author intimated he expected to have more discoveries and I didn't see anything. 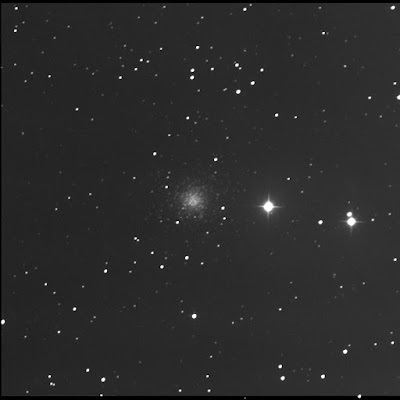 Processed the LRGB data files for 54 Sagittarii gathered back in October. And did an experiment. I specifically processed in GIMP 2.8 to update my workflow notes. Pale orange (A) and pale blue or white (C). The faint B star doesn't seem to have any particular colour. Luminance 3x20, RGB 3x10 each. A member of the Occult Watcher Yahoo!Group just posted the following. I have downloaded the LunarOccultation dll, (for double stars) and i get the prediction feed presented which I have ticked. But the add-in doesnt appear in the add-in menu under >configure add-ins. As i understand it the add-in needs the location of Occult4 to work. Have i missed something? Hristo directed the user to the "publish" page which he had updated by deleting the link to the old MSI file. All right. Determined that a backup uninterruptible power supply failed during the recent power outage at the CAO. Recommended a replacement battery. Hristo forwarded an observation of mine to Dave. I thought it worrisome that the Occult installation instructions did not refer to the correct number of files in the archive. These days with virus, trojan, and malware concerns, it is a little unnerving when the zip file has different content than expected. He thanked me and said "I fully agree." Good. Hopefully, another little issue can be corrected to help future users. I was still a little troubled that I wasn't seeing any Lunar Occultation events listed in OW. So I did a bit of digging. At one point, I opened the regional double star file, NADoubles.txt, for North America. Wanted to see what was inside, if anything. Purportedly it is maintained by Mr Timerson. I was surprised to find a listing for the months of December and January, about two to three dozen each. But the star numbers didn't make any sense. Dec 1 noted "444cK6" and Dec 15 showed "2223SK0." These didn't look like SAO numbers. Was the ending bit hexadecimal? No... It looked like stellar class. Nothing came up in SkyTools. 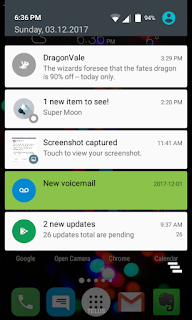 The Dec 15 items caught my eye. That date got me thinking so I fired up Stellarium and advanced the time rate. And after a while, Zuben Alkarab slid into view! An interesting triple star. Oh ho. In SkyTools, I switched to the Special Events tab, activated the Two Bodies search, and looked for an occultation of the Moon and γ (gamma) Lib. Yes. Dec 15. Entry (or disappearance) at 9:59, mid-occultation at 10:36, and exit (or reappearance) at 11:17. Oh. Daylight. Maybe that's why it wasn't showing in Occult Watcher. On a whim, initiated a Google search on 2223SK0. Got a hit. A page at the Lunar Occultations web site, showing the predictions for 2017 for Blue Springs Missouri. Coming together. But I still didn't understand exactly why some of these events were not showing in my candidate list. Made a location in OW for Atlanta, Georgia that seemed better positioned. Nope. Still nothing. Launched Occult to see if there was an issue there. Occult shows the unusual star numbers. OK. Found some correlating information there. ZC and XZ lunar catalogues. Displayed a chart for the Moon with Zuben Alkarab. Tried to produce an animated GIF. Changed the filter settings in OW and forced a sync. Ah ha! At the bottom of the listing, the Lunar Occultation section appeared! So, at last, everything is working as required. Learned that ZC is the zodiacal catalogue. Dealt with power outage issues at the Carr Astronomical Observatory. Likely the high winds knocked down a tree. 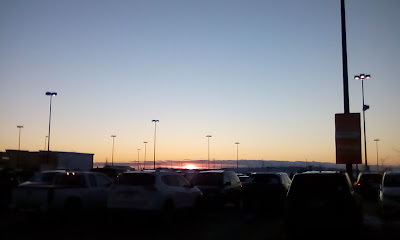 Tentatively accepted the Wed 21 Feb date for delivering my double star presentation during the RASC Toronto Centre recreational astronomy night meeting. Received a note from Hristo regarding the Occult Watcher software download page. You are quite right, the page is confusing. I should fix that. Please ignore the "Download" link at the top to an .msi file, and follow the instructions underneath that are based on OWUpdate.zip. OK, good. I made a contribution. Hopefully others will not experience the same pitfalls as me. Headed to the back yard. I couldn't see Polaris in the little scope. Oops. Forgot to open the shutter on the camera. Still couldn't see anything. Aimed to the full Moon. Ah ha! Played with the exposure setting in the AMcap software. But couldn't seem to stop it from being washed out. Moving the slider to the left increased the exposure value. Heading to Polaris again. Nothing. Went to Vega and saw the star. Shown my red flashlight in to see the reticule. OK. So it works. The Logitech webcam attached to the Vixen polar axis scope. I was very happy the star was relatively in focus. But I need better software to give me more control of the camera. I want better exposure control. And a gamma control. I explained the current/latest problem to Hristo. 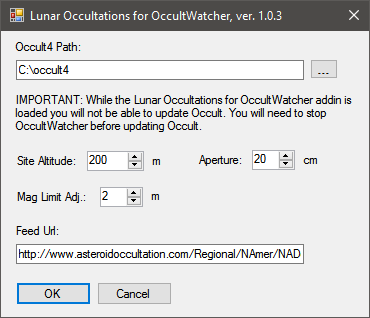 The OccultTools and Lunar Occ add-ins were not listing in the menu. So I could not run them. 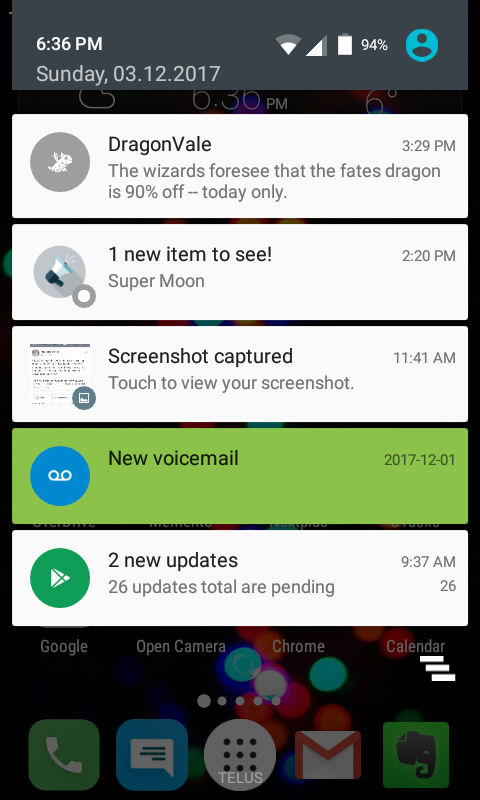 Sent a screen snap of the Add-ins menu and the app folder. I explained I was very interested in lunar occultations of double stars. That's why I wanted to add this capability to Occult Watcher. After running the MS debugging tool, I sent the captured log. He said something odd. "Looking at the files in C:\Occult Watcher, it doesn't seem that this is a new installation." 'Cause I had most recently deleted and reinstalled everything on Friday. Hristo gave me a sequence of steps to follow. He asked me to not change or rename any files in the "Occult Watcher" folder. I had only done that in one test. He asked me to change anything in the registry. I had never done that. If things were still wobbly, I'd need to send the logs again. I just don't like the impression I get in these kind of situations from some software developers. It's not my fault. I didn't initially break this software. Maybe renaming some DLLs was problematic but it was for a very specific test. I didn't do it to break things. Why would I want to make things worse. And there was an assumption made that I was tinkering in the registry. I do not do so lightly ordinarily. And I didn't ever venture in for Occult Watcher. Of late I have taken a conciliatory stance because I just want this software to work properly, as designed, as promised. I know that this developer is a volunteer. So demands of users can be perhaps daunting and overwhelming. I want to comply. But I also don't want to be treated poorly. I think the developer was getting frustrated and took a good approach, backing up a bit, regrouping. Let's get this sorted. I explained that this was all media hype. Selling newspapers! A disproportionate inflation of an event. The reference to "super" Moon was that our natural satellite was closer to the Earth than at other times and therefore bigger and brighter. But I cautioned that if one was examining the Moon with just their eyes, they would not be able to see the difference. 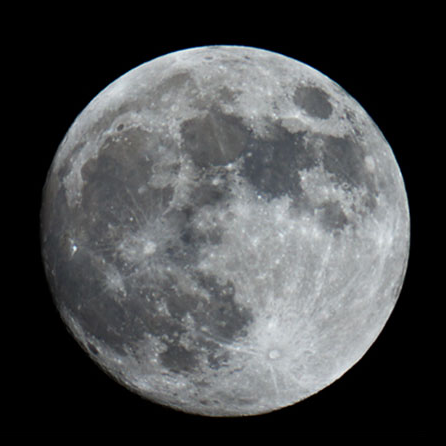 The next full Moon would be fractionally larger than the previous month's full phase. And it would be a tiny bit brighter. But a casual observer, using their eyes would not be able to tell. 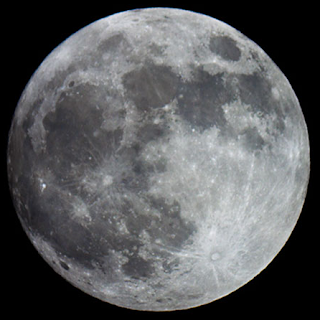 If carefully photographing the Moon over each full Moon phase and comparing the results, one would see the very slight difference in size. Joel also referred to a surveying instrument in his field that could measure this. To measure the change in brightness would require specialised light-sensitive equipment. This also gave me the opportunity to address the illusion effect, when the Moon is near the horizon. I showed Bree show to measure the Moon's diameter against her pinkie fingernail. I encouraged her to use this standard any time she thought the Moon looked different. She might be surprised. Now all that said, I'm happy that people are talking about celestial objects and looking up in the night sky 'cause it's cool and all. The more we can talk about astronomy and science and physics the better. I shared I was worried about the crying wolf effect. That civilians going outside will say, "Huh. Moon looks the same. Nothing special." And feel disappointed or even upset. And then in the future not bother getting off the couch. When the bright Moon emerged from the mottled clouds, we measured it. Tidied up my NGC life list over on the blog companion web site. Was missing a couple of entries. So there's over 410 now. And some RASC Finest NGCs were not tagged. Done, now. Again, I have 5 in the Finest category. And one revisited item hadn't been updated correctly; only 4 to re-examine. Yeah. 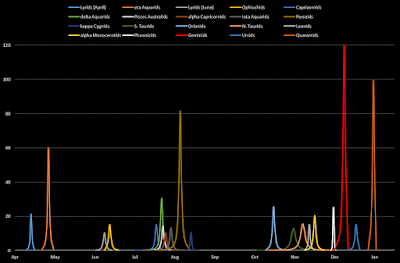 With some suggestions from Chris Vaughan, I regenerated my meteor plot chart. In particular, I used a Cauchy distribution formula to calculate intermediate values to the peak. This is much better than my original graph where Excel interpolated the results, given the minimal data, with smoothed lines. This effectively shows that meteor showers start slow, slowly build, then, blammo!, there's lots of activity, and then they fall off rapidly. 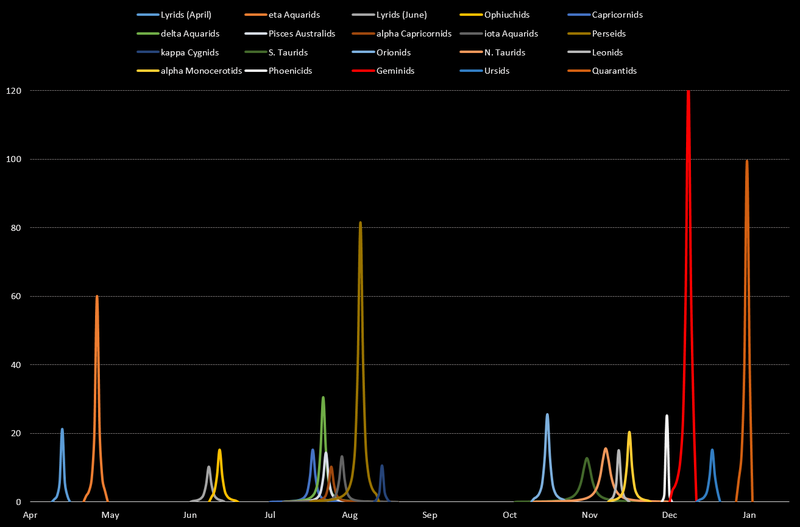 And, again, the main reason for my making this type of chart was to emphasise our meteor "seasons." Mid-July for a month is a high-water mark with 5 to 6 simultaneous showers. But fall and winter is the best with multiple showers running from mid-October into January plus the two best showers for the whole year. Did some more testing for Greg on SkyTools (under old Windows XP). Intriguing results. But whatever he did re-enabled the "current" update procedure as well as the online shared list downloads. Yeh! I was able get the current comets, minor planets, and supernovae updated and download the new Coldfield Observatory double star list to the John Repeat Dance computer. I think Hristo was getting upset with me. On the Yahoo!Group, I said I had deleted everything and reinstalled but it was not working. He thought I was doing "random" things. He pulled our conversation off-line saying it was "not relevant" to others. That's a poor way of saying that. The problem-solving and debugging is not helpful; a final outcome report would be. He addressed my past query at last. He said that where Occult Watcher stored settings was irrelevant. Gah. As an IT person, I'd prefer a more sophisticated response. Still, he wanted to help. He asked me to carefully explain the problem. He wanted details and screenshots. He also wanted a DebugView log capture.